Caesar Rodney was an American lawyer who is most famous for being a member of the Continental Congress and a signer of the Declaration of Independence. Of the three delegates from Delaware who signed the Declaration, he was the only one native to the state. He was also one of only two bachelors who signed the Declaration of Independence. Caesar Rodney is noted for his emergency ride to Philadelphia, through thunderstorms and severe summer heat, despite suffering from asthma and cancer, that broke Delaware's deadlock in the vote for independence. It was Rodney's historic ride that was commemorated on the Delaware state quarter in 1999. Caesar Rodney has a rather large number of family connections to other famous people. This is mainly due to his connections to English royalty. One of the more interesting and closest royal connections is that of King Henry VIII. He also has connections to at least two of Henry's wives, Anne Boleyn and Jane Seymour. 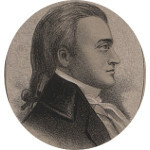 Caesar Rodney also has a number of connections to U.S. Presidents, First Ladies, and other Signers of the U. S. Declaration of Independence.